My Extreme Toast Mosaic – A New World Record! 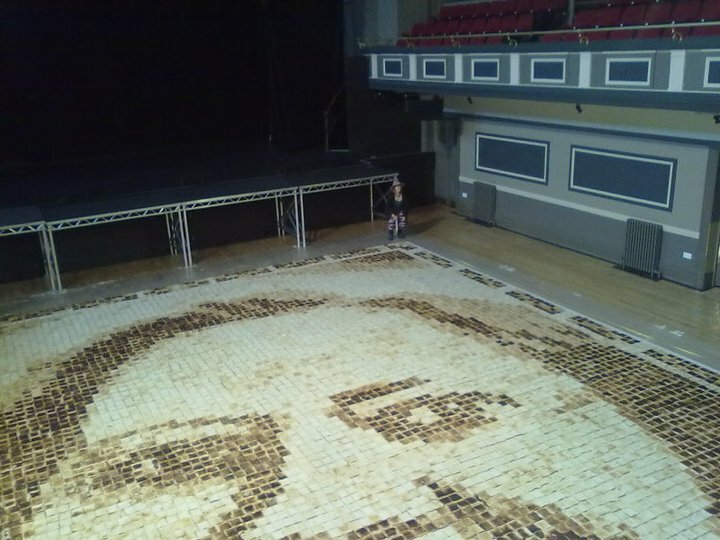 So last weekend we entered the Guinness Book of World Records by making a the biggest ever mosaic in toast. We organised it as a HTC Wildfire Experience through a competition that we won. This meant that I got a load of my facebook friends together, including having Greg and Cory flown over from the States! It was so awesome to have so many friends together and it made me laugh so much that our friend Ian decided to get the bus back to Leicester with us, even though, strictly speaking, he had no way to get home!! On Thursday, we did a series of 8 much smaller toast mosaics of various celebrities for the Daily Mail. I have no idea if it’s actually in the paper, it is supposed to be in today, will send the Extreme Husband to Tesco in a bit to go check out the situation. Doing these mosaics was actually a lot harder as there were only a few of us there. The next day my knees and the front of my legs were absolutely stiff as – still feeling it a bit now. Unbelievable stuff. Makes you glad to have a blog called ‘Extreme Housewifery’ – this is definitely the highlight so far, so now we have to figure out what we can do to top it… Crocheting at the summit of Mount Killimanjaro? Feeding the 5000 by cooking a massive tarka dal in the Punjab? Redecorating the hall entirely in beer bottle labels? I don’t know, but these all sound like great places to start. It has just reminded me to take the opportunities that arise in life. We grasped this one with both hands and had the most wonderful day. We’re starting to get back to normal now – I’m spending the weekend resetting the house by doing a bit of low-level extreme housewifery, but I am determined to keep making my life sparkly and fun wherever I can, and if I can include my friends in that and share something special with them then so much the better!